Yale University Press, 9780300167467, 168pp. "Astringent and absorbing. . . . "Iphigenia in Forest Hills" casts, from its first pages, a genuine spell the kind of spell to which Ms. Malcolm's admirers (and I am one) have become addicted." Dwight Garner, "New York Times"
With the intellectual and emotional precision for which she is known, Malcolm looks at the trial "a contest between competing narratives" from every conceivable angle. It is the chasm between our ideals of justice and the human factors that influence every trial from divergent lawyering abilities to the nature of jury selection, the malleability of evidence, and the disposition of the judge that is perhaps most striking. 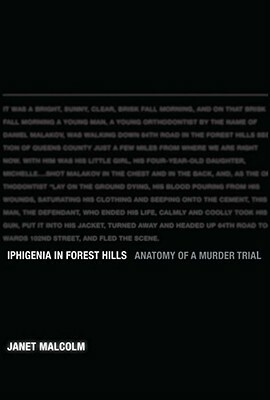 Surely one of the most keenly observed trial books ever written, "Iphigenia in Forest Hills" is ultimately about character and "reasonable doubt." As Jeffrey Rosen writes, it is "as suspenseful and exciting as a detective story, with all the moral and intellectual interest of a great novel." ""Iphigenia in Forest Hills" is another dazzling triumph from Janet Malcolm. Here, as always, Malcolm's work inspires the best kind of disquiet in a reader the obligation to think." Jeffrey Toobin, author of "The Nine: Inside the Secret World of the Supreme Court"
"A remarkable achievement that ranks with Malcolm's greatest books. Her scrupulous reporting and interviews with protagonists on both sides of the trial make her own narrative as suspenseful and exciting as a detective story, with all the moral and intellectual interest of a great novel." Jeffrey Rosen, author of "The Supreme Court: The Personalities and Rivalries that Defined America. Janet Malcolm is the author of "Two Lives: Gertrude and Alice," which won the PEN Biography Award, "The Journalist and the Murderer," "The Silent Woman: Sylvia Plath and Ted Hughes," "Reading Chekhov," "Burdock," and other books. Malcolm writes frequently for the "New Yorker" and the "New York Review of Books." She lives in New York City. Runner-up for the Biography/Autobiography category at the Los Angeles Book Festival. Finalist for the 2012 Book of the Year in the True Crime category, as awarded by ForeWord Magazine.